The GORT-5 has two equivalent forms, Form A and Form B. Each form contains 16 developmentally sequenced reading passages with five comprehension questions each. An optional miscue analysis system allows reading specialists to analyze reading errors and tailor interventions to specific needs. Norms were extended upward to age 23 years, 11 months. Fluency. The Fluency Score is a combination of the Rate and Accuracy Scores. Oral Reading Index. The Oral Reading Index is a composite score formed by combining studentsâ€™ Fluency and Comprehension scaled scores. For both forms, average internal consistency (content sampling) reliability coefficients exceed .90. Determining strengths and weaknesses. 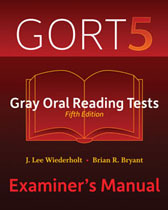 The GORT-5 can be used to compare intra-individual reading skills (e.g., reading rate vs. comprehension) and to help tailor interventions to specific needs. Evaluating student progress in reading. Having two equivalent forms enables examiners to conduct pre-and post-intervention testing to measure progress.